Veteran midfielder to announce Stateside switch. Chelsea legend Frank Lampard is set to announce his move to new Major League Soccer franchise New York City FC in the next couple of days, according to the Daily Star. The 36-year-old will link up with the Manchester City owned franchise in January for pre-season training, but will remain fit until then by training with the Blues, who had released him at the end of the previous campaign. The decision to head to America also appears to have closed the curtain on his career with the England national team. Despite playing a limited role for Chelsea last season he still earned himself a call up to Roy Hodgson’s World Cup squad, and even captained the side for their final group game against the already qualified Costa Rica. However, Hodgson likes to stick to players plying their trade in the Premier League as he overlooked former Spurs striker Jermaine Defoe, even though he was in prolific form for Canadian club Toronto FC. 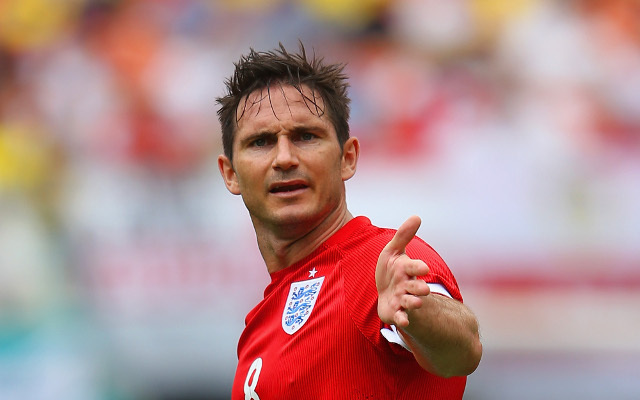 When asked about international retirement after the Costa Rica game Lampard said that he had yet to make up his mind over whether he was to hang up his boots at international level.